Mind Enterprises is a name that’s fast becoming synonymous with playful, eclectic dance releases paired with a striking, vintage aesthetic. 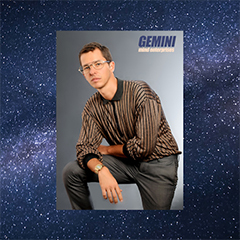 Today, the Italian DJ and producer launches his latest single ‘Gemini’ – a twinkling blend of retro synths, groove-fuelled guitar chords and a disco-driven production. ‘Gemini’ follows the vibrant release ‘S.H.A.K.E’, which saw Tirone adopt a Bill Gates meets Tony Montana character in the accompanying video – WATCH HERE. The colourful video saw support from titles including NOTION, Dancing Astronaut and Spindle Magazine. Following his journey into uncharted afro-disco territories with his 2016 album Idealist, Mind Enterprises returned with addictive italo-disco 2017 release ‘Idol’. As well as being named on ShortList’s ‘50 Greatest Songs of 2017’, the release received support from a wealth of titles including Mixmag, DUMMY, The Ransom Note and PHOENIX Mag. While Tirone might seem to have found inspiration through his national heritage, his geographical journey tells a fuller story. Having fled his hometown of Turin in 2011, Tirone lived in East London for 6 years before recently relocating to the tropical island of Gran Canaria – “the southest place in Europe”, as he puts it. However, location only tells part of the story – as the name suggests Mind Enterprises has always been about Tirone tapping his own imagination, taking inspiration from a host of eclectic means.